Two days on from his incredible, four-goal performance, capped with the early frontrunner for goal of the year, the hockey world is still buzzing about nineteen-year-old sensation Tomas Hertl. But on Thursday, the conversation took a slight turn when Washington Capitals' coach Adam Oates gave voice to a growing crowd of dissenters, calling Hertl's move disrespectful. 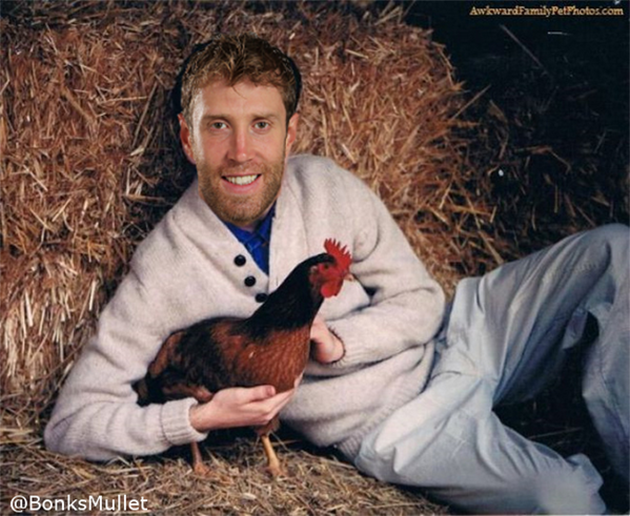 And that's when Joe Thornton came to Hertl's rescue. Sensing that the conversation was beginning to turn against his linemate, the Sharks' captain decided to do his captainly duty Thursday, turning the attention away from Tomas Hertl and squarely on himself. In Hertl's defense, he's new to this country. That's a good way to get deported. But seriously, oh my God. Thornton can't possibly have actually said that, can he? David Pollak? Yeah, we can probably safely assume that Joe Thornton didn't expect to be quoted. But he was. And now here we are. Amazingly, Thornton's never had a four-goal game. He's at nearly a point a game over his lengthy NHL career, racking up 1120 points in 1128 games with his mad dangles, and he's registered four career hat tricks, the most recent of which came October 27, 2010 versus the New Jersey Devils. But he's never dropped four on an opponent. Which is why he's never dropped trou on an opponent. When he does, though, well, if you thought Hertl's between-the-legs move was over the top, just wait for Jumbo Joe's to rock out on his fourth tally of the night. It'll bring new meaning to the term "junk goal".